Set in a prime location along Mahawella Beach, Kurumba House is a great bet for vacationers seeking a restful beachside holiday. The tranquility of the fishing village permeates into the home, creating just the right ambience for a relaxing getaway. 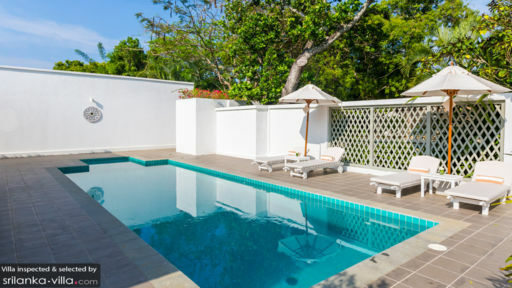 With two bedrooms, a lush garden and beautifully appointed living spaces, Kurumba House is ideally kitted out for small families or sharing among two couples. Vacationers are comfortably accommodated in two bedrooms. Each features a plush double bed with canopy netting, sea vistas, air conditioned interiors, writing desk, armchair and attached en suite. A neatly manicured garden stretches out from the veranda, providing vacationers with ample space for stretching out, playing outdoor games or sunbathing with views out to the sea. There’s plenty of sun loungers and hammocks to go around, as well as a timber ambalama for outdoor massages, yoga and shaded siestas. The interiors at Kurumba House are best described as contemporary, uncluttered and cosy - just right for creating an inviting and cosy ambience in a seaside holiday home. Soak up the tropical vibes as you relax in the open-air common area. The space comes complete with sofas, a coffee table, daybed and dining set. Ceiling fans keep the area cool and breezy, and a tasteful selection of artwork adds pops of colour to the neutral colour scheme. Meals may be prepared in the fully equipped Western-style kitchen. Kurumba House stands out with its impeccable service and warm hospitality. Service is delivered with a smile, and the on-site team takes care of your laundry and housekeeping needs. A daily breakfast service is provided, while in-villa lunches and dinners are available at additional cost. Airport transfers, along with vehicle rental are charged at additional cost. 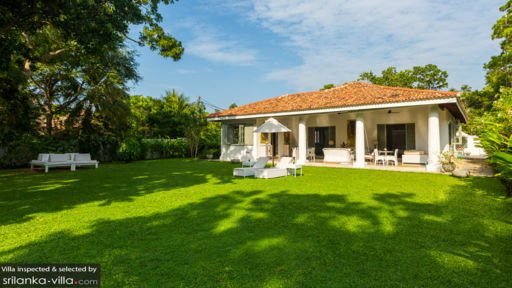 Kurumba House is located in Matara, along the southern coastline of Sri Lanka. From your villa, you’re within easy access to the beach, as well as restaurants and local amenities. 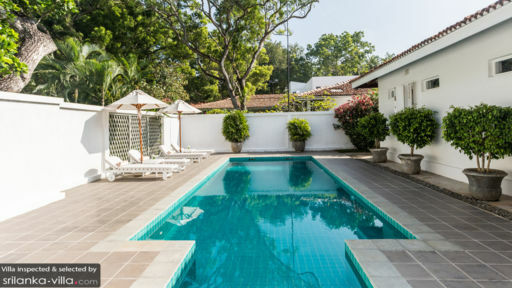 Kurumba House makes a great base for day trips out to the best attractions in South Sri Lanka - from the historic Galle Fort, to the postcard-perfect coasts of Mirissa or excellent surf at Weligama Bay. Hop into a car for a one-hour drive to Galle Fort, a walled city that dates back to 1588. Take a walk through the narrow streets of the town to explore its well-preserved colonial buildings, churches, boutiques, cafes and restaurants. At sunset, go for a stroll along the fort walls to take in the incredible coastal views. It’s best to combine your day trip with a visit to neighbouring attractions like the Martin Wickramasinghe Folk Museum Complex or Handunugoda Tea Factory. Beach-goers and nature lovers will enjoy spending the day at Mirissa, located about 30 minutes’ drive from your villa. The beach is picturesque, draws in a good mix of vacationers and features a variety of restaurants and beach bars. Mirissa Harbour, just eight minutes’ drive from the beach is a jumping-off point for whale watching tours. The months of November till March are the best times for the activity. Sri Lanka’s sprawling national parks and nature sites are not to be missed. The nearest attractions, such as Yala National Park, Udawalawe National Park and Sinharaja Forest Reserve are located about three hours’ drive from your villa.